FamilyFitnessFilanthropyEtc: Family: Oops I forgot to post on Christmas Day! Family: Oops I forgot to post on Christmas Day! As I sit on the beach in the community where my Mom grew up with my son playing in the sand with beach toys I can see the circle of life clearly on this Christmas Day. I used to do the same thing. Body surf, build sand castles and chase seagulls on this same stip of beautiful beach. I am reminded of the blessings in my life. My parents, sisters, husband, son and all my friends. I hope today that you too are reminded of the many blessing in your life! Merry Christmas! 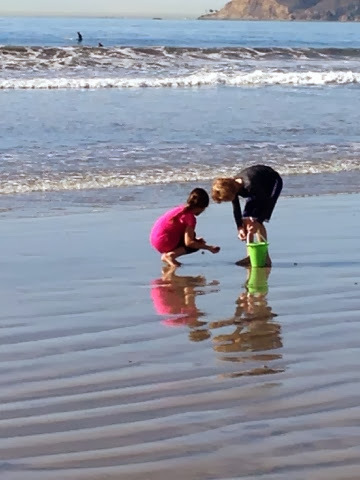 Beach combing with a new friend!